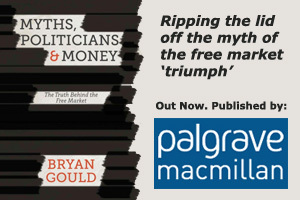 My new book, Myths, Politicians and Money, was recently published in London by Palgrave Macmillan to coincide with the Labour Party conference in Brighton. It has been very well received and reviewed, and has attracted a good deal of attention. It is a comprehensive account of what I think has gone wrong for Western democracies over the last three decades; the argument is summarised in a separate posting (called Myths, Politicians and Money) of a piece I wrote for the Yorkshire Post. Find out more here.